Christopher Banks, a famous English detective, spent his childhood in Shanghai before the Sino-Japanese War………………………..
Set in 16th century Tudor England under King Henry VIII, Dissolution by C.J. Sansom, an historic crime novel, affords us a look into a time of religious upheaval and superstition. 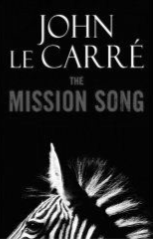 LeCarré once again shows us the heart of darkness that exists in government, institutions, big business, and in people. A trauma occurs in your life. It devastates you. How do you deal with it? Updike’s trenchant novel Terrorist is about 18-year-old American-born Ahmad Ashmawy Mulloy, son of an Irish-American mother and a long-gone Egyptian father. by Wilma Mazo If the winter doldrums have got you feeling dispirited, what you definitely need is a good book to distract you. Come on in to your Andes Public Library, and check out The Little Friend by Donna Tartt, if you like books set in the deep South with that characteristic Southern world view.